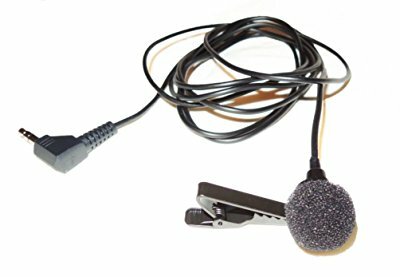 Lavalier or lapel microphones are commonly used in the television industry as they make it easy to speak or sing with your hands free. In recent times, a growing number of musicians have turned onto these for live shows, as they are almost invisible. They just get clipped onto a piece of garment and off you go. Of course, they can’t match the quality of sound you get from professional vocal microphones, but you probably won’t tell the difference until you hit a high profile recording studio. With a good sound guy you’ll sound terrific at your next gig, and no one will even notice you wearing a lavalier microphone. So, that’s why I’ve gathered a bunch of really good clip-on mics to review and help you choose one that suits your needs and budget. There really is no need to reach for the most expensive one, as there are quite a few competitively priced contenders on the market which offer quite similar performance at a much lower price. Here’s my roundup of the best lavalier microphones for fellow musicians and singers, and some for other purposes like speech recording, as well. Let’s break the ice with one of the most popular items on the market, the Smartlav+ from the fantastic folks at Rode, who are renowned for making excellent microphones for all purposes. It’s an improved version of a previous model and it’s designed with smartphone users in mind, as you only need to plug it into the headphone jack of your phone to use it. As such, it works with any type of app which can record directly from the microphone input. Rode also has its own app which you can use to edit and publish your recordings, so it’s highly convenient if you don’t have your own sound engineer or when you have to accomplish everything on your own. 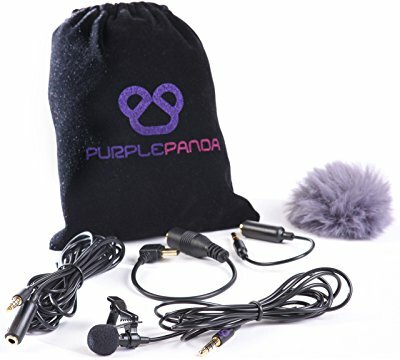 The package includes a neat carrying pouch and a clip for attaching the microphone to any type of garment. It also has a foamy pop shield which comes in really handy if you’re recording something in windy weather conditions. The cable is also moisture proof, in case you’re somewhere out there singing in the rain. At this price range, Rode has come up with a very good microphone with solid recording quality, so it’s going to be tough finding a better contender for the price. Even though the brand name comes off as a little bit too cheesy, and there is no actual model name or code, don’t let that scare you off. Obviously, it’s the only lavalier microphone that this brand offers. This is probably one of the most affordably priced lapel microphones in the market, and while you can’t really expect a miraculous performance, it is actually a competent performer. It is an omnidirectional microphone, which means it can be placed anywhere under your mouth. Just clip it onto your shirt and it will pick up everything you say. Plug it into your smartphone with a 3.5mm TTRS jack and you can start recording or broadcasting immediately. As is the case with most lavalier microphones, this one doesn’t need any batteries as it draws the power from your smartphone or tablet. The package includes a carrying pouch and additional extra-length cable, which makes up for the fact that this isn’t a wireless microphone. 79 inches of cable should be enough to allow you to move around a room with no hassle. 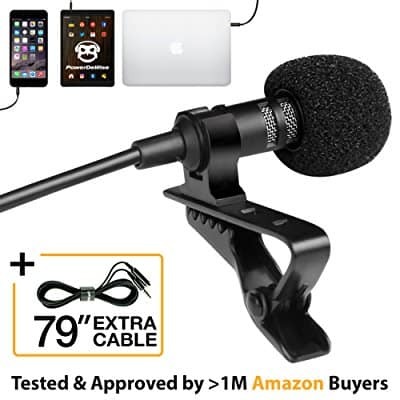 If you’re just entering the world of lavalier lapel microphones and you don’t have a limitless budget, this might be just the product to get you started, so long as you don’t go into this expecting sound quality on par with much more expensive professional models. Moving into a bit pricier territory, let’s talk about the marvelous Pro 70 from the renowned gurus at Audio-Technica. They simply can’t disappoint, even if they tried. The manufacturer is one of the leading acts in the world of microphone, so it’s somewhat obvious that one of their products had to be included here. The Pro 70 is a sturdy, well-built piece of gear that will last for eons and always provide you with excellent performance. It is actually a small condenser microphone which sounds great both for vocal performances and instruments. 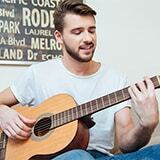 Aside from the garment clip-on, it comes fitted with a mounting system for an acoustic guitar. Unlike most other contenders, it features the metal grill as a pop filter and it largely contributes to the fact that the Pro 70 really sounds like a much more expensive professional microphone. Another nice touch is an included switch for cutting off low frequencies, and the microphone can be powered by batteries or phantom power from another device it’s connected to. I’ve struggled really hard to find any major flaws and managed to find just one - when you rub the wire it will be audible. Still, it isn’t something you can’t work around rather easily. Now, this is quite a lot of bang for your back. Just by checking the list of items included in the package, it seems like good value for money, but let’s not get carried away without checking the build quality and the recording quality first. The package itself is quite neat, and it includes a pouch for all the goodies. Among the accessories you’ll find a TRS adapter and a mini USB adapter which is highly convenient for connecting to various devices such as cameras, smartphones, GoPro cameras, and what not. There is a 9.8ft extension cord so you can move around freely and there are two clips in the package, just in case one gets broken. They are both quite sturdy and hold the microphone firmly in place once it is attached to a piece of garment. The fuzzy windscreen sure looks sweet, even though it will provide you with only minor wind protection and might affect the recording quality significantly. At this price range you can’t really expect any miracle to happen. The kit features an e-book which will help you get started with recording techniques and making your own audio and video recordings. This is a really cute package which will make for a great gift to a person who aspires to get into vlogging and similar venture. Even though it’s fairly cheap when compared to its rivals, don’t let the price fool you. This is a piece of high quality equipment, designed exclusively for speech recording. That being said, it won’t greet you with any additional gimmicks and accessories. You just get the mic, a clip, and the cable, and that’s it. 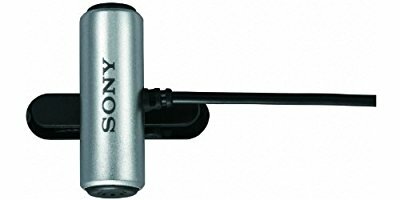 It may not be among the best clip-on mics in the world, as it’s far below that price range, but it is quite a respectable little thing. It’s characterized by a minimalist styling that will look good with any outfit. Incorporated into the design is the microphone rotation, so it can easily be positioned any way you want it. Simple but effective seems to be the motto under which the whole thing was designed. 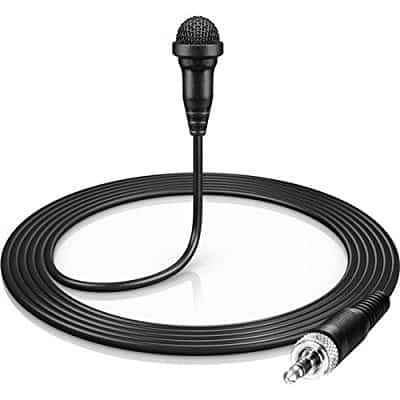 The microphone itself is of omnidirectional type and it provides sufficiently good sound recording quality, especially once you take the price into consideration. Still, due to its polar pattern, it sometimes tends to collect quite a lot of ambient noise during recording. If you need a cheap mic for speech recording which will look sleek and understated, you don’t have to look any further. One of the major players in the industry, Sennheiser really cuts it down to the bone when microphones of any kind are concerned. One of the pricier models on my list here, it packs quite a punch and it’s no small wonder that it is considered a standard in the TV industry. It can be seen on many pro journalists and numerous TV shows anywhere in the world, as it is nothing short of brilliant when it comes to recording voices and musical instruments. Even though quite small in size, the ME-2 II comes with a circle polar pattern which means that it provides the ultimate clarity of sound and prevents the pickup of almost all noises in the surrounding area. Designed to fit any kind of garment, it is equipped with a heavy duty cable and a mini jack which makes it instantly compatible with most wireless systems. It is really hard to find any major flaws with this one, aside from the fact that it doesn’t really come cheap and it features no glitzy accessories. Last but not the least, let’s take a look at the most middle-of-the-road contender here. It is still on the affordable side on the market but offers quite a lot for your buck. The design may not be the latest cutting edge thing, but it’s still sleek and non-intrusive, so it will fit most outfits. 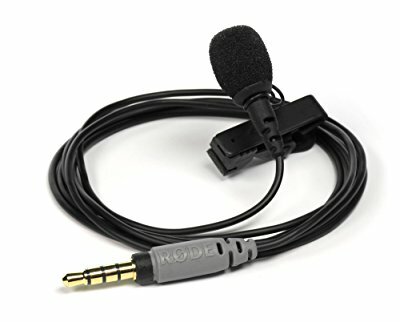 It comes with a simple gator clip which holds it firmly in place, while the mic can be covered by a small windscreen in case you’re recording somewhere outside. When tested for recording quality, it sure can deliver, even when used as a microphone for an acoustic guitar, which should speak volumes when sound clarity is concerned. All the details come out nice and crispy, even with the windscreen on. The only major issue here is the fact that the cord is non-detachable and the windscreen tends to become loose over time, so make sure you don’t lose it. Well, it all depends on what you’re after. You could go for a wired mic, a mic that will fit right onto your smartphone, or a wireless one that will be much more expensive for obvious reasons. Yes, many of the best lapel mics always look nice and sleek, but it’s what inside the little capsule that matters. For most common purposes, condenser mics that tend to provide the best results, but often you’ll need a preamplifier to provide it with additional power. If you intend to work them hard, your lavalier microphones need to be energy efficient. Some of them use batteries while some use phantom power from another device. Size matters. It needs to be as small as possible, without compromising sound quality. Of course, almost always you’ll be guided by your budget. I’ve covered a few of the most promising contenders in the market for the title of the best lavalier microphone. So, now it shouldn’t be that hard to decide which one would work best for what you have in mind.